Kanye West, never one to express his opinion, has some thoughts on 3D printers. He's concerned that they're a threat to the fashion industry, and he's probably right. In a recent episode of Keeping Up With the Kardashians, Kanye took a tour of an Armenian art school where he came face to face with a 3D printer. 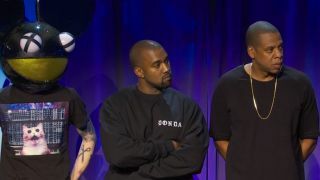 "This is what I'm afraid of right here - 3D printing - because the internet destroyed the music industry, and this is what we're afraid of now with the textile industry," said Kanye. "There will come a time where, it's like, people are making the shoes at home"
It will probably be a few years before we can 3D print our own Yeezys, but Kanye's concern is reasonable. Maybe if any of us could afford them, we might be dissuaded from pirating a pair? Just a thought. You can watch the full clip over here.